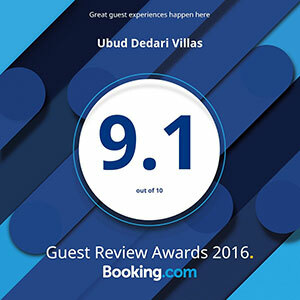 Ubud Dedari Villas is located in an area rich in myth and history. The places mentioned in the passages below surround our location – Bedulu, Blahbatu, Petanu River, Elephant Cave, Tirtha Empul and Gunung Kawi. If you have questions about visiting any of them, please ask our friendly staff for assistance. “It was long ago, in the time when the great mountain, the Gunung Agung, had just been made. A fierce and terrible Detya, Maya Denawa, was in power over the land. He was jealous of the gods and did not allow the people to give them offerings. The gods banded together to fight the demon and a war ensued in which many people were killed. The boy and girl twins married and had children, also twins, who continued to rule in Pejeng. These twins also married and had more twins, until a seventh generation of twin Mesula-Mesuli. The last male of these twins rejected his black and ugly sister in marriage for a girl dancer, thus breaking the line of royal twins. The last twins born was endowed with great magic powers; he could allow a retainer to cut his head off and replace it without harm to himself. But one day the head fell into a river and was lost, carried away in the rushing stream of a sudden banjir. The retainer in desperation cut off the head of a pig and placed it on the shoulder of the king, who from then on had to live on a high tower and forbade his subjects to look up at him. He was seen, however, by a small child who passed unnoticed and who spread the news of the pig-headed king, who became then known as Bedaulu (Bedulu), He-Who-Changed-Heads. The location of this spring is supposed to be the holy spring of Tirta Empul near Tampaksiring. The gods attacked again, Maya Denawa was wounded, and his blood flowed into into the great river Petanu that runs near Blahbatu. Today the waters from this river may not be used to irrigate rice fields because it is believed that rice watered by it will, when cut, exude blood. Bukit Darma: In Kutri near Bedulu there is another antiquity of the classic period, also related to Erlangga. It is the beautiful statue of Mahendradatta, Erlangga’s mother, as the goddess of death, Durga. It is preserve in the sanctuary of Bukit Darma, which archeologists believe to be the burial site of Erlangga’s mother. The statue is badly worn, but it can still be seen that it was of the purest classic lines. Goa Gajah: Together with Gunung Kawi, the best known relic of the ancient art is the famous “Elephant Cave” near Bedulu. Goa Gajah is a great hollowed rock, perhaps the former residence of a hermit, elaborately carved on the outside, covered with representation of stylized rocks, forests, waves, animals, and people running in panic because directly aver the entrance is the head of a great monster with bulging eyes who splits the rock with his enormous fat hands. Nieuwenkamp says that it may represent Pasupati, who divided the mountain Mahameru into two parts and, taking them in his hands, place each half in Bali as the Gunung Agung and the Batur. There are a number of ancient stone water-sprout outside the cave, and on the inside is a statue of Ganeca in a central niche, with a lingga on either side. The Goa Gajah dates also from the eleventh century and perhaps receives the popular name of “Elephant Cave” because of the statue, inside, of the god Ganeca, shaped like an elephant. But Goris attribute the name to the fact that the river Petanu, which runs near the cave, was called in old times Lwa Gajah, the “elephant river.” Elephants have never existed in Bali and the elephant motifs that appear so frequently in Balinese art were importations from India or Java. As of Gunung Kawi, Kbo Iwa is also, according to popular belief, the author of the cave. Other hermitages with rock reliefs are the one nearby called Toya Pulu; the Goa Racksasa near Ubud; Jakut Paku, both on the river Oos (Uwos); and the caves near Kapal in Badung. Pejeng: In the rice fields approaching Pejeng there is a beautiful stone water-sprout in the shape of a youthful hermit holding in his hand a small human figure out of whose body once issued a stream of water. Farther on, in what apprears to be the former site of a temple, are scattered fragments of classic statues; an altar of human skulls; the vague silhouette of a slim woman, covered with damp moss, fallen and half buried. The most complete statue is that of a wild raksasa crowned with skulls and about to drink from a larger, stylized human skull. In Pura Panataran Sasih, the temple where the bronze drum is kept, there are a number of ancient statues, the majority being commemorative statues of former kings. Panulisan: In the ruins of Pura Panulisan on the mountain of the same name are some fine statues of kings from eleventh century. The temple was destroyed by an earthquake and, despite the fact that it is regarded as of great holiness, an extravagant stairway of cement has been build to reach it, but the temple has not been repaired. Today one may visit the ruins only with a written permit from the local pungawa. Other issue worthy of mention here are the figures of Durga in the temple Ponjok Batu on the road to Tejakula in North Bali and the great statue of Dewa Ratu Pancering Jagat, over twelve feet high, the largest statue in Bali, kept jealously out of sight in the tower (meru) of the temple Trunyan, a Bali Aga village on the eastern shore of Lake Batur. The statue is considered very old and is held to have magic power. No one is allowed even to go into the tower, unless it is the selected “virgin” boys (truna) of the village, who on certain dates clean and paint the statue with a mixture of chalk, honey, and water, accompanied by elaborate carefully observed ceremonials. An excellent description of interesting feasts has been written by Walter Spies in “Das Grosse Fest im Dorfe Trunyan” (see bibliography). The ancient Balinese also left a number of ancient bronzes cast by the cire perdue process, some in the form of plates with inscriptions, drums, and little statues of deities and kings, some classic in style like the beautiful ones found in Java, others of a more primitive, perhaps local style. All of these antiquities are not in museums, but are still the property of the people, kept in the temples and honored because of their antiquity, brought out of their wrappings once a year on the occasion of the temple feast of the village. "Amazing location, great staff, great rooms"
Views 5 star, staff awesome, villa rooms were so spacious and fitted with everything needed. The valley walk to the elephant temple is great too. On call food service and free shuttle to the centre and back... Recommended highly for the people wanting a natural retreat not to far from the centre. Staff were amazing and willing to do anything for you. Villas were beautiful bathroom was amazing, brought you right back to nature. Only 10 min to Ubud centre with free shuttle services. Breakfast served in the confort of your villa. Easy 10/15min walk through jungle to tourist attraction elephant temple. We got a special through Expedia and believe we got an absolute bargain. Would defiantly stay again one night wasn't enough. "Infinity pool with nice views over rainforest"
Bright, spacious room. Loved having our own terrace, the pool is great and the view amazing. Friendly staff. Can't find anything wrong, it's our favourite stay in Bali.